White Rock Snow Gear is designed and manufactured to exceptional standards using high quality materials and attention to detail throughout the manufacturing process. The simple philosophy behind the brand is just to make ski and snowboard wear that they would like to wear and use themselves. All their gear is therefore both functional and fashionable, giving exceptional performance when you need it most. With designs used by beginners all the way through to expert Olympic athletes*, White Rock’s 2010/11 Snow Gear Range keeps you looking good and feeling great on the piste. These jackets and trousers give you two outfits for the price of one - perfect for adding a bit of variation to your outfit during the week. Simply reverse the trousers and you’ve got two different colours to choose from to match your jacket of the day! All the seams on White Rock garments are fully taped and you only have to count the number of seams on a jacket to understand how time consuming this is during production. Some companies will cut corners and say that only ‘critical’ seams need taping but this leaves the wearer vulnerable during adverse weather conditions. White Rock tape all the seams to ensure that their garments are fully waterproof and you stay dry. As important as the waterproof properties of a technical garment are its breathable properties. This is the ability of the fabric to wick (move) moisture (perspiration) from the inside of the garment to the outside so keeping the wearer dry and warm. A very active person can perspire up to 1 litre in an hour - the fabric we use has the ability to wick away up to 8 litres of moisture in a 24 hour period. A small non-electric device that aids in locating you should you be unfortunate enough to be involved in an avalanche. All ski resorts in Europe and many in the US carry equipment that can detect the Recco device. Can be machine washed without damage. Adds to the adaptability of this garment… if you don’t need the hood then just zip it off and stash it in any of the pockets. 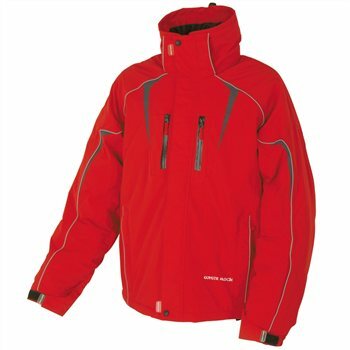 Fleece lining increases the thermal properties of the garment and feels warm and soft. Fleece has a very high warmth to weight ratio making it ideal for use in ski wear - micro fleece has even more advanced warmth to weight properties for top end fabrics. Anyone who has carried a hydration pouch and had the frustration of the hydration tube freezing - even when insulated - will understand the need for this additional pocket. It will hold a 1-1.5 litre hydration pouch and has routing for the tube to be held in place inside the jacket and therefore insulated by body heat. Alternatively the pocket can be used for anything you need to take with you, such as sandwiches! A pocket specifically designed to incorporate an MP3 player, with wire routing from the pocket up to the collar for your ear plugs. Ideal for some soothing music whilst you glide across the pristine white powder. A handy extra deep pocket specially designed to hold and protect your goggles whilst they're not needed. Also good for storing any other items you need to take with you. The next generation of ski wear innovation includes waterproof zips as standard. Top of the range zips are coated with a waterproof cover making the vulnerable join waterproof and keeping you dry on the inside. Especially important with snow gear as snow works into every join and crevice if it's allowed. Many ‘stretch’ fabrics on the market only stretch in 2 or 4 ways… our 360 stretch fabric stretches in every direction and so moves better with you without hindering your movement. Ski resorts use a number of different methods for checking ski lift passes. Most of our jackets have a drop down pass pocket which allows the wearer to show their pass with the minimum of hassle and still have it remain totally safe and secure. The drop down pass pocket is located near the lower front hem of the jack - simply slide in your pass, release the Velcro and your pass is exposed for inspection. A standard feature, most ski jackets carry a standard pass pocket allowing easy access to your lift pass even when wearing gloves. Some jackets feature forearm pockets for 'touch' passes. This highly adaptable jacket comes with a second ‘zip out’ inner jacket that can be worn either as an additional layer of insulation or worn totally separately - so you can wear the shell, the inner jacket or combine the two - hence 3in1 - giving you the ability to adapt better to your environment.